Screening of living kidney donors may require scintigraphy to split glomerular filtration rate (GFR). To determine the usefulness of computed tomography (CT) to split GFR, we compared scintigraphy-split GFR to CT-split GFR. We evaluated CT-split GFR as a screening test to detect scintigraphy-split GFR lower than 40 mL/min/1.73 m2/kidney. 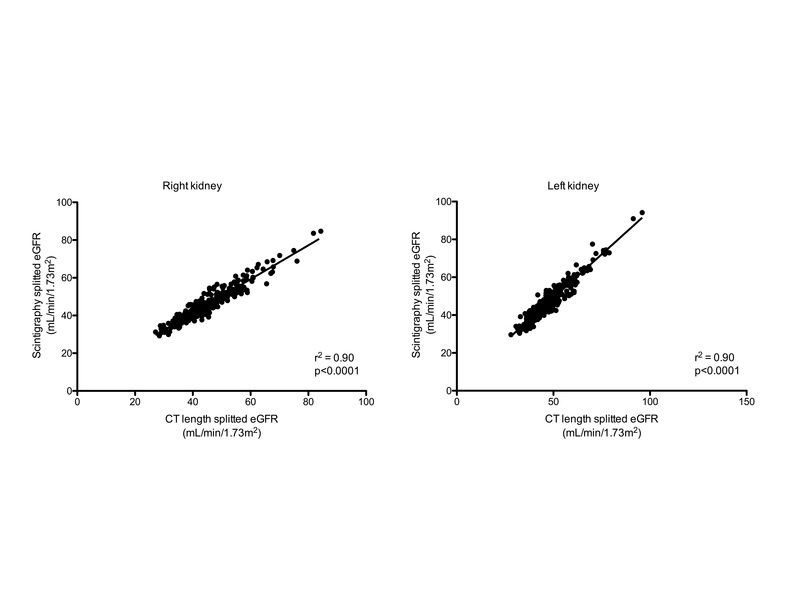 This was a monocentric retrospective study on 346 potential living donors who had GFR measurement, renal scintigraphy, and CT. We predicted GFR for each kidney by splitting GFR using the following formula: Volume-split GFR for a given kidney = measured GFR*[volume of this kidney/(volume of this kidney + volume of the opposite kidney)]. The same formula was used for length-split GFR. We compared length- and volume-split GFR to scintigraphy-split GFR at donation and with a 4-year follow-up. A better correlation was observed between length-split GFR and scintigraphy-split GFR (r = 0.92) than between volume-split GFR and scintigraphy-split GFR (r = 0.89). 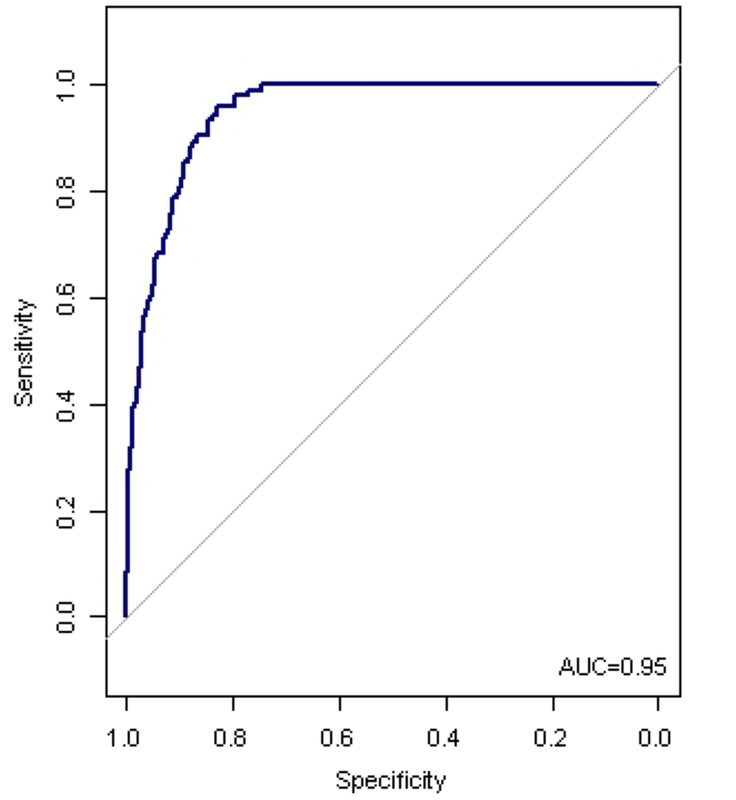 A length-split GFR threshold of 45 mL/min/1.73 m2/kidney had a sensitivity of 100 % and a specificity of 75 % to detect scintigraphy-split GFR less than 40 mL/min/1.73 m2/kidney. 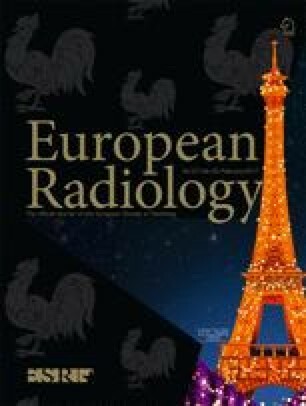 Both techniques with their respective thresholds detected living donors with similar eGFR evolution during follow-up. Length-split GFR can be used to detect patients requiring scintigraphy. • Kidney length screening can replace scintigraphy screening. Christophe Legendre and Marie Courbebaisse contributed equally to this work. The online version of this article (doi: 10.1007/s00330-016-4410-7) contains supplementary material, which is available to authorized users. The scientific guarantor of this publication is Marie Courbebaisse. François Gaillard thanks Ecole de l'INSERM-Liliane Bettencourt. The authors of this manuscript declare no relationships with any companies, whose products or services may be related to the subject matter of the article. The authors state that this work has not received any funding. No complex statistical methods were necessary for this paper. Institutional Review Board approval was obtained, REF2013-11-10. Written informed consent was waived by the Institutional Review Board. Methodology: retrospective, diagnostic or prognostic study, performed at one institution.